Public Radio Barbie : Soapbox Barbie turns 50 next month. And we'd like you to upload photos of your favorite Barbie dolls to Flickr -- whether she's posed in front of the St. Louis Arch, on top of a mountain, or with the pot roast on the dinner table. Next weekend, we're throwing a birthday party of sorts for everyone's favorite impossibly slender doll, Barbie. She'll be 50-years-old, but she sure doesn't look it. Over the past five decades, she's had countless makeovers -- Malibu, Princess, Southern Belle, and Harley-Davidson Barbie, just to name a few. She's traveled the world. She's played guitar in a rock band. She's acted in a Todd Haynes film. What can't she do? She's probably at work on the next great American novel. Whatever the state of your Barbie (limbless or in pristine condition), we'd like you to send us a photo. And be creative: if you live near the St. Louis arch, photograph her there. Or take your Barbie hiking in the mountains and get her picture on the overlook. 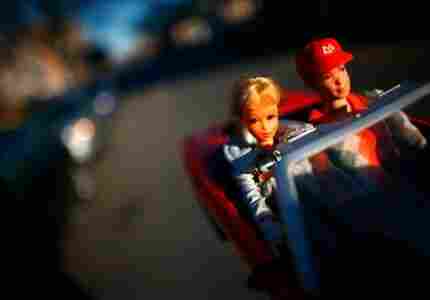 Upload your photos to Flickr and tag them "NPRBARBIE." If your Barbie has a story, include that in the caption field. We'll be featuring some of the best here all week long.